Click here for the map of the main campus. Single-entry permits are sold on a space-available basis at UCLA information kiosks adjacent to campus parking structures and lots. Most parking areas are accessible by payment of the $12 per entry fee (medical areas are higher). Please refer to the map for orientation to the UCLA campus. Hourly parking is available at Parking Pay Stations at some lots and structures. For details click here. Structure 32 and Lot 36 have a special $8 single-entry rate valid after 4:30pm Mon-Thu, 3pm Fri, and all day Sat and Sun. Single-entry permits may be purchased from the dispensing machines located on the lower level of the Structure 32 or at the Kinross Ave. entrance of Lot 36 after 4:30pm. Single-entry daytime (prior to the times listed above) permits to Structure 32 may be purchased for $12 on a space-available basis at the Westwood Plaza Kiosk. Permits: Permits are valid in Structures CHS and SV and numbered lots and structures with the exception of Structures 1, 5, and 6, and Lots 13, 17, and 35. 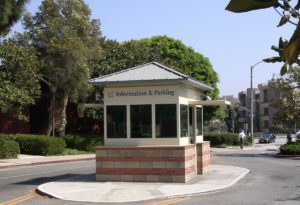 Structure 1 is reserved for visitors to the Ronald Reagan UCLA Medical Center. Structure 5 is reserved for special events at Royce Hall. Permits are valid in “Blue,””X,” and unmarked spaces. They are not valid in spaces marked “Reserved at all Times” or in designated pay-per-space stalls. Permits expire at the end of the current quarter. If our course meets beyond the permit expiration date, you must pay $12 for each extra meeting. Permits and card keys may be purchased when you enroll online, by phone, or in person at the Extension Department of Student and Alumni Services. Subsequent to enrollment, permits are available for purchase by phone, in person, or by mail. Valid after 12 pm on Fridays and all day Saturday and Sunday except for the structures and lots listed above. Valid after 4:30 pm Monday through Thursday, after 12 pm Friday, and all day Saturday and Sunday except for the structures and lots listed above. UCLA Extension Building, 10995 Le Conte Ave.
1010 Westwood Center, 1010 Westwood Blvd. Extension Lindbrook Center, 10920 Lindbrook Dr.
Extension Gayley Center, 1145 Gayley Ave.
For daytime courses held Monday through Friday at any of our Westwood Village Centers, we recommend the use of commercial lots in the Village. For courses held after 4:30 pm, permit parking is available for UCLA Lot 36 and Structure 32 (see single-entry information above). Commercial lots also are open at night. Click here for details. Parking costs $13 per entry after 5:30 pm on weekdays and all day Saturday and Sunday. Ample additional parking is available in nearby public parking structures at a variety of rates. UCLA permits are not valid at the Park at DTLA Parking Structure (see map). Parking permit refunds are granted in full through the fourth week of the quarter. With the exception of canceled or rescheduled courses, all refund requests after the refund deadline will be subject to a pro-rata refund calculation of $20 per week, beginning with the fifth week of the quarter. Permits purchased after the refund deadline will be subject to the standard pro-rata refund calculation. The University is not responsible for stolen permits or those lost in the mail or by the student. Lost or stolen permits should be reported to Extension’s Cashier Office. A replacement permit may be purchased for $30. Bicycle racks and lockers are available throughout UCLA and in lot 36 adjacent to the Village. For additional information, including bicycle parking space locations, visit https://main.transportation.ucla.edu/.